Ronald T. Potter-Efron, MSW, PhD and Patricia S. Potter-Efron, MS.
"An excellent, innovative and highly practical book." The Columbia Review. 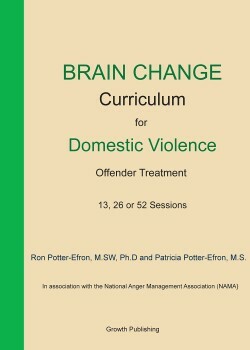 “Brain Change Curriculum for Domestic Violence Offender Treatment” by Ronald T. Potter-Efron, MSW, PhD and Patricia S. Potter-Efron, MS offers a comprehensive curriculum (of 13, 26 or 52 Sessions) for the treatment of domestic violence and anger management. This is a highly innovative work with a strong emphasis on proven treatment procedures and processes, ensuring safety while aiming for a brain change and behavior modification with consistent results and pro-active, long-term maintenance. This work is both practical and inspiring, with a perfect balance between well-tested treatment methods and fresh innovations in the highly challenging field of behavioral science and treatment-inducing modification. Clearly, this work is the result of extensive clinical experience and theoretical scientific knowledge. The book offers clinicians and trainers an invaluable resource, as the authors relied on their combined, decades’ long clinical, academic and research involvement as leaders in the treatment of domestic violence offenders and anger management. (See authors’ biographical information below.) The result is truly impressive. “Brain Change Curriculum for Domestic Violence Offender Treatment” provides excellent training session outlines and descriptions, log book and homework, as well as insightful yet accessible discussions of brain change, cognitive and behavioral modifications, stress management skills, conflict resolution skills, substance abuse, selfishness vs. mutual caring, as well as “The big three: depression, impulsive anger/aggression and bing drinking. It is most comprehensive and detailed volume, yet straightforward and accessible, well written and fair-minded. The appended lists, worksheets, and sample reports would be very helpful to clinicians and therapists, as well as the individuals involved. In our opinion, anyone called upon to work with, or assist individuals or couple affected by anger management or domestic violence challenges, would benefit tremendously from studying this work with the greatest attention. It be highly effective and helpful for lecturers and trainers, as well as clinical mental health professionals, community service providers, domestic violence volunteers and pastors, as well as legal professionals active in the fields of family and divorce law. In their Preface, the authors stated: “We attempt in this volume to interweave the fields of anger management, domestic violence and neuroscience while delivering a practical, useful product facilitators can immediately use with participants.” Our review of “Brain Change Curriculum for Domestic Violence Offender Treatment” confirms that the authors indeed met their goals and have even gone beyond, producing a truly rich and practical work that’s sure to become a constant reference volume at practitioners’ back-and-call, and in general advances the field of domestic violence and anger management understanding and treatment. This is an excellent and highly beneficial work. Patricia S. Potter-Efron, MS, is a clinical psychotherapist, domestic violence group facilitator, and co-author of numerous books including “Letting Go of Shame”. She is a Distinguished Diplomate of the National Anger Management Association (NAMA) and a Certified Anger Management Specialist-V (CAMS-V) and Certified Domestic Violence Specialist-V (CDVS-V).